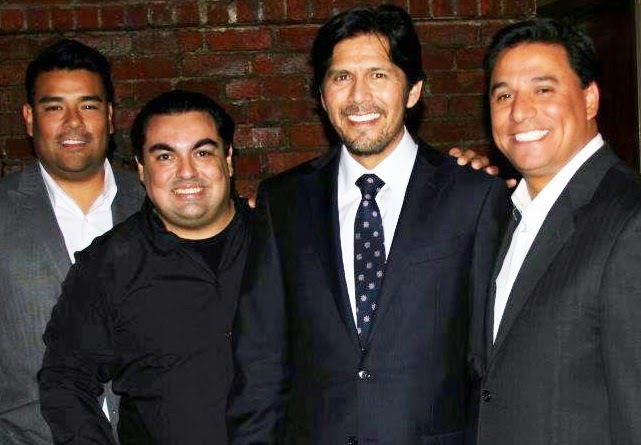 Above l. to r.: State Senator Ricardo Lara, Ulisses Sánchez, State Senator Kevin de León and LA Councilmember-elect José Huizar. A six-month journey ended with a flash flood of text messages shortly after the absentee ballot count was announced by the Los Angeles City Clerk’s Office. The reported tally showed Los Angeles City Councilmember José Huizar with an insurmountable 64%-24% lead over former Los Angeles County Supervisor Gloria Molina. The election was over. The rest of the results were only a formality in declaring Huizar the winner by a 42-point margin, a margin of victory which has been the subject of many news headlines, online forums and tweets since Election Day. At its foundation, the electoral victory was based on carefully strategized and executive efforts by the campaign team to engage the voters, mobilize its supporters and present a message of positive reinforcement to all community members, all while never leaving no stone unturned and taking no advantage for granted. During each of the candidate forum, Councilmember Huizar would continually highlight various achievements in each respective area and would provide a vision of what the future looked like if he were re-elected. This information, along with the established support by community leaders throughout the district, gave him instant credibility with the voters. By contrast, Gloria Molina would show her lack of knowledge on the key issues facing each area, which was her campaign with a lack the strong grassroots support that Huizar benefited from. This allowed us to have a more substantive engagement with voters, frame the dialogue around the issues that were important to the voters and play a vital role online in highlighting the major differences between the two. For example, at the Downtown candidate forum, Molina would attack the present developments in Downtown as making the area “too dense” and the need to preserve parking and making more available to the area. Many of the Downtown stakeholders present were taken aback by her answers, as they know that the development taking place in the area makes it easier to live, work and play in the area, thereby limiting the need for to many to have cars. After the debate, we began engaging members of the Downtown Facebook groups and forums to remind them of the contributions that Councilmember Huizar had made to the Downtown communities and inform community stakeholders of how Ms. Molina’s vision for Downtown was out of place with the current growth taking place in the area. It did not take long for hashtags such as #toodense to start trending on public forums by commentators who shared in the belief that every great city has a great Downtown, a downtown made more vibrant when there is more walkability and less of a share of public right of way taken by commuters and their cars. In El Sereno, on the proposed expansion of the 710 Freeway northbound, Ms. Molina would state that she would like further studies to be done to explore the best available options. This was in complete contrast to her support of the proposed expansion, as highlighted in the editorial published in the San Gabriel Valley Tribune on February 20th, 2014. In her editorial, she went as far as calling those who were opposed to the project as being “fear mongers.” Within minutes of her public sudden change of opinion, we had obtained a copy of the editorial she co-authored, flooded our social media networks with copies of the editorial and made sure local area voters knew that Councilmember Huizar had opposed the proposed expansion. We did this through targeted local mailings highlighting their differences. Additionally, community members created their own innovative memes to highlight Ms. Molina’s ever-changing opinion on such a polarizing topic. All of these factors were key in the end result. Our strategy with social media, our field operation and in the community candidate forums was to: 1) engage the voter, 2) gain the voter’s support and, 3) mobilize the voter. One example was our effort to outreach to the Filipino community. As mentioned by several media outlets since Election Day, Councilmember Huizar received the endorsement of WBO Welterweight Boxing Champion and Filipino Congressmember Manny Pacquiao. Soon after receiving Pacquiao’s endorsement, a mailer was sent to all Tagalog-speaking voters in the district with a photo of Huizar and Pacquaio together with a note from Pacquiao expressing his support. No voting group was left untouched and similar efforts throughout the district proved to be invaluable to securing the level of voter support that resulted in victory. With a need to keep our supporters engaged and getting additional assistance throughout the campaign, our weekly e-newsletter to our network ensured that we maintained a consistent open line of communication with our supporters. From highlighting key endorsements of the week, keeping them informed of any significant news and mobilizing volunteers for our campaign outreach efforts, it was an effective resource that kept our base engaged. Gloria Molina’s record was never a focal point of her campaign and she failed to get as much traction out of her role as the trail blazing Latina in office that she was known for. From the outside, it appeared that her campaign team as a whole was never truly organized. She allowed her supporters to engage individuals in online forums and in community debates in a manner undignified of a candidate of her stature. They were rude, disrespectful to the Councilmember and the voters at large, lacked any substance of value regarding Ms. Molina’s record and her agenda for the communities, and centralized their messaging around issues that ultimately did not matter to the engaged voter. Their behavior online was so out of line that they were being kicked out and banned from local online forums (one went as far as to compare the moderator of the forum to North Korea’s Kim Jong-Un). Their behavior, which appeared to have been condoned by Ms. Molina, ended up alienating her campaign from the disenchanted voters who she so badly needed to win over. When the final ballots were tallied, José Huizar was re-elected by the voters of the 14th Council District by a 42-point margin over Gloria Molina (65.75% to Molina’s 23.93%). It was achieved through a campaign strategy that incorporated all the tools that were at its disposal to engage the voter, empower the voter and ultimately win over the voter.